Thank God for sisters. I am blessed to have two great female siblings. Of course we detested each other growing up; no surprise there. Even the closest family members experience growing pains. Age has its advantages. Through all our disagreements over the years, a lasting bond has survived. Thus, I am enjoying the closeness of my older sister since she now lives a ten minute drive from me. We can kick back on her back porch and critique the golfers on the 17th green. And, I make the annual pilgrimage to Wayne, Illinois to visit the younger sister. There I can escape the oppressive Texas heat, as well as run the “prairie path” that traverses the beautiful horse country and small village of historic Wayne. I can wax nostalgic passing the 19th architecture that has been meticulously preserved, and I can drink in that familiar aroma of fresh cut lawns and sea of perennials. However, the real benefits of the “sisterhood”, lively conversation, timely consolation, the cacophony of laughter, and an unconditional acceptance, are what I treasure. Dad was stationed in Alaska during WWII. 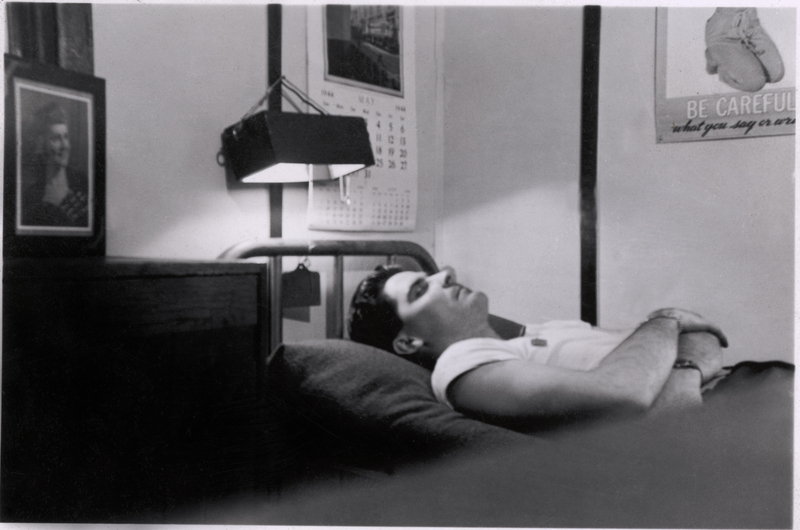 The photograph of him on his bunk is more than what one might call a “snapshot”. Did the maker intentionally arrange the photograph: the posing, the lighting, the props, or was it just happenstance, a fellow soldier walking by and making the photo? The fact that all the elements are there in the image makes the visual statement that it is not just a “snapshot”, no matter what the scenario. The calendar at the top is dated May 1944, the spartan surroundings indicate a soldiers quarters, the poster to the right is a 1940’s illustrative style, and the relaxed pose suggests a contemplative mood, perhaps indicating a rest after a long day, or a longing for family, friends and loved ones far away. The latter explanation seems more plausible since the photograph to the left is the girlfriend. My mother. Kudos and thank you to the image maker for creating this beautiful visual memory, and I thank my parents for preserving it for future generations. The most treasured image can be a snapshot. Sometimes the most treasured image can be a snapshot. Scary thought for me. Maybe that sort of thinking would make my profession obsolete. Especially, with digital and media technology we are being bombarded with imagery every time we look at our computer screen and our smart phones. There are no excuses now for not capturing those treasured moments that hopefully when we are old and gray transport us to an earlier time. 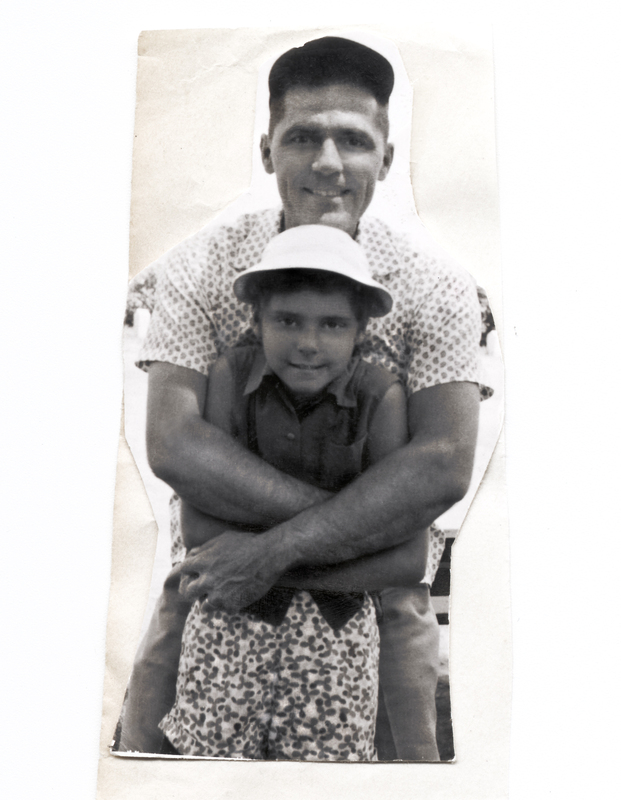 My parents, products of the depression and the great war, certainly regarded the value of making photographs since the future for most was gravely in doubt. Fortunately for me, I have many “snapshots” in my archive that date as early as the turn of the century. Yeah, that would be the 19th century. Almost all are black and white silver prints, a technology that is now obsolete, at least in commercial photo production. Thankfully, they are in remarkably pristine condition. As images they have transcended “snapshot” status by their mere longevity. Perhaps, those Facebook snaps will someday be viewed in the same regard. Or will they just be up in a cloud, somewhere? Time will tell. I am very excited about this year 2011. Every day poses new possibilities, new images, and a new vision. I am reinvigorated since the Master of Photography achievement this past January and I am sincerely grateful to many of my clients who have supported me as an artist and a photographic technician. Through the years they have trusted my eye and my vision. What an awesome responsibility for me. I will continue to learn and grow so that I will always provide the best product for my clients and be worthy of their investment. Let’s keep in touch.